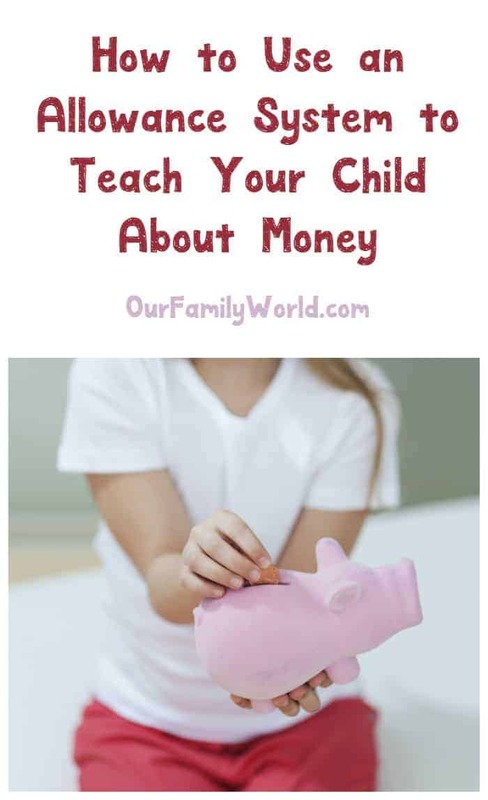 Wondering how to use an allowance system to teach your child about money? Check out these great tips from Michael Banks of The Fortunate Investor! He’ll tell you how to set up an allowance depending on your child’s age, what your kids should be expected to pay for and more to help them learn to set up a budget and stick to it. What Should You Expect Your Child to Pay For? Do you have any other tips on how to use an allowance system to teach kids about money? Share in the comments! Teaching a child how to be financially responsible at a young age can be a huge benefit to them long term, and should be seen as of equal importance to other life lessons we teach our children. While there are several ways to teach kids about money, implementing an allowance system has proven to be one of the most successful methods. By taking the time to set up and utilize an allowance system for your child, you are teaching your child skills that will allow them to grow into financially savvy adults. While it depends on the child, most children should be ready to experiment with saving, spending, and budgeting at age ten. There is no “one size fits all” program. Instead, you should consider three main factors to create an allowance system that meets your child’s needs. What your child should be expected to pay for depends mostly on their age. For pre-teens (10-12): Keep it simple by only requiring your child to pay for their “extras.” Anything that you do not consider to be a necessity, such as a movie with friends or new toy should be their responsibility. This allows your child to learn how to budget properly, but see no huge consequences should they make a budgeting mistake. For teenagers (13-18): Expect teens to cover more of life’s necessities along with their “extras.” Things like gas, clothing, and meals with friends are all expenses that your teenager should be capable of budgeting for. This will ensure that they begin to understand how far a dollar goes, and are one step closer to living independently, while still with your support. After you have set up a general outline of your system and determined what your child should have to pay for, it is time to determine how much money your child will receive. Essentially, you want your child to have to save for bigger items they may want. This will allow them to save a small portion of their allowance each week for the item and feel a sense of accomplishment when they finally have enough for their purchase. The most important thing to remember when deciding how much money to give is that you want to set your child up for success, so be realistic about what amount will allow them to purchase what they want without having to sacrifice too much or have an overabundance of money. If you follow this general outline, you are well on your way to teaching your child the basics of being financially responsible. Being that financial challenges are one of the top stressors in most adult’s lives, the knowledge of how to properly save, spend, and budget is something that will be a huge benefit to your child throughout their adult life. About the Author: Michael Banks, otherwise known as Mr. Fortunate Investor, is a seasoned finance professional turned blogger who founded The Fortunate Investor. With 20 years of professional experience in the financial services industry, he uses his expertise to turn simple lessons on money into lifelong habits that form the basis for a successful financial future. Sweep Tight Loves Our Sling Bags! It is so important to teach children fiscal responsibility, starting them when they are young is definitely the way to go! Great article! We just started giving my son an allowance for chores around the house! My parents did this with me when I was younger. However, they never made me pay rent or anything as I got older which actually helped me a lot with savings. This is an important topic for parents. I hope my sister implements this idea with her daughter once her daughter gets a little older. This seems like a good system to reward/discipline your child as well. An allowance system is always a great way to teach kids the value of money. This way they know how much they have to work to get the things they want. This is really a great idea, i love that its broken down by age as well. It’s hard to determine sometimes what might be fair for them and how they should earn it. i will be using this for my sons now! We give my daughter an allowance for chores and she’s allowed to take that to yard sales and buy whatever she wants. She really has to think about if she’s getting a bargain, or if she should wait for the next sale to see if she’d like something else. She has learned a lot about money this way. My kids always got an allowance as long as they did their chores. They could earn extra money with extra chores. We have not done so well in this area. I feel like everyone approaches it differently. I like your breakdown of how and why allowance should be given at different ages. I have always wondered when it would be an appropriate time to start an allowance for my son. I would like to show him how to earn responsibility. I never did give my kiddos allowance. I think it would be helped them learn financial responsibility. I’ve wondered about this recently, so I’m happy to read the recommended age is 10. We want our kids to grow up understanding the importance of saving and budgeting. Thanks for the tips! We got an allowance with I was a kid. It increased as we got older, but we had to earn it by doing our chores. Not only does it teach you about money, but also about being responsible. This is a great idea! I’d love to teach my daughters on how to properly handle their money while they’re young so they won’t struggle when they’re older. It’s definitely worth a shot! This is a brilliant idea. It is important to teach our kids how to use their allowance while they’re still young so when they grow old, they knew already how to spend money in a right way.